I’m probably living Ms Amy Cheong’s worst nightmare. All my neighbours are Malay. I live in an HDB point block and mine is the only Chinese family living on my floor. Yes, I’m aware that my neighbours may be reading this. Oh, before I continue, let me say that even though I’ve never hosted the National Day Parade like Daniel Ong – I’ve only marched in the parade – I still love my multi-racial country. Anyway, problems with neighbours have been in the news lately, from Ms Cheong’s Facebook rant about a noisy Malay void deck wedding to Ong’s neighbour’s noisy renovations. I avoid problems with my neighbours by not holding noisy void deck weddings or doing noisy renovations, both of which I can’t afford anyway. Furthermore, I make it a point to interact with my neighbours as little possible because I believe familiarity breeds contempt. My fear is that the more familiar with me they are, the more contemptuous of me they would become. I don’t believe in kampung spirit because the only kampung spirit I know is pontianak and Halloween is over. The only time when I’m sort of forced to have a conversation with any of my neighbours is when I’m taking the lift. Once, I was waiting for the lift with my neighbours, an older couple, when the husband started making small talk with me. I panicked. Not only was he speaking to me, but he was speaking to me in Malay. This was not long after I moved in, so we didn’t know each other very well. I guess one thing he didn’t know about me was that I didn’t speak Malay. But I hid my panic and just nodded and smiled and nodded and wondered why the lift was taking so long. Sensing that something wasn’t quite right, the man then asked me something rather intently in Malay. So I came up with a brand new move – I shrugged. He looked at me as if I was the biggest idiot he had ever met. That was when his wife said something to me in English to which I could respond with actual words and the husband finally figured out I hadn’t understood a single thing he had said. So now I was not only the biggest idiot he had ever met, but also a sociopath who would mislead an old man about my language ability. The three of us took the lift together and it was awkward silence all the way down. Hence my policy of minimal interaction. That is not to say I’m an unfriendly neighbour. I still nod and smile, but I just try to stay out of people’s business. Then a few days ago, I bumped into another neighbour as I was getting out of the lift. He is a taxi driver. So I instinctively wanted to ask him if he makes $7,000 a month – as a joke. 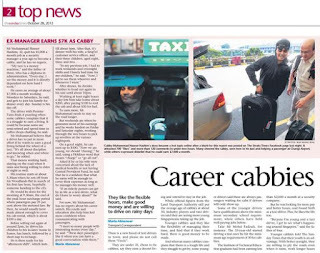 I mean, that seemed to be what everyone was talking about online last week after The Sunday Times reported that a taxi driver claimed he was earning the incredible sum of $7,000 a month. How would I like it if a neighbour asked me how much I made? As much as I would like it if he asked me how often I Google myself. A joke could easily turn into angry letters and police reports Daniel Ong-style. What would Ms Cheong do? I remembered my policy of minimal interaction. So I just nodded and smiled silently at my taxi-driver neighbour, who nodded silently back. Maybe he was moody because he wasn’t making $7,000 a month. Or he has an even stricter policy of minimal interaction than I do. You know, I really should use the stairs more often. It’s good exercise.